Step 1: Connect one end of the HDMI cable to the HDMI port at the back (or side) of your HDTV and the other end to the HDMI port on the adapter. Step 2: Hold the charger and plug the microUSB to the port on the adapter and plug the charger to the electricity source. This will power the adapter up. 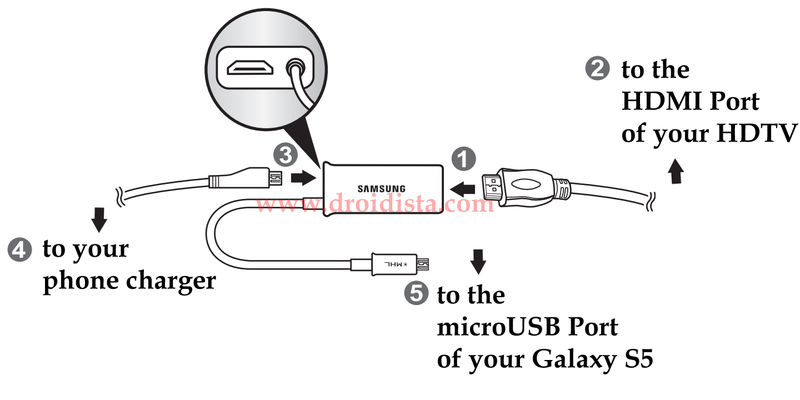 Step 3: Now, plug the microUSB connector from the adapter to the microUSB port on your Samsung Galaxy S5. Step 4: Set the TV to display the picture fed through the HDMI port where you plug the HDMI cable. Your HDTV will immediately mirror what's on your phone screen. Step 1: Connect one end of the HDMI cable to the port at the back of your TV, and the other to the HDMI port on the AllShare Cast Wireless Hub. Step 2: Plug the microUSB connector of the charger to the port on the wireless hub and plug it to an approved power source. The hub's status indicator will now start blinking. Press the Reset button on the hub to make it ready. Step 3: On your Galaxy S5, tap the Apps icon from the Home screen and then choose Settings. Under CONNECT AND SHARE section tap Screen Mirroring. Step 4: If the wireless hub is ready, your phone can detect it and it's name often starts with the word "Dongle." Tap on it and you're good to go. Your HDTV will now display whatever it is that you want to mirror. Enjoy! I hope these tutorials have somehow helped you. Thanks for reading.